Over the past few months, several bookmakers have offered existing customers odds boosts, which essentially enhance the odds of whichever selection you decide to bet on. These can be used to our advantage and allow us to make a guaranteed profit no matter what happens in the event. Some bookmakers even often these odds boosts on a daily basis meaning we could easily do 30 of these types of bets in just one month. In this article, we will look at the best ways of making a profit from them so that you can maximise your profits with these kinds of reload offers. Using the Oddsmatcher will show you the most profitable bets to do at one moment in time as soon as you click the refresh button. To make profits from odds boosts, you will have to ensure you find a match on the Oddsmatcher with a rating of 99% or higher. If it is any less, you will find it is just honestly not worth the time or the effort of doing that particular match. Most of the odds boosts will also have a maximum stake amount. When I have been offered odds boosts by Ladbrokes, the maximum I can stake is £200.00 a time. With other bookmakers it could be different but I also know at William Hill, they offer odds boosts daily and these are also £200.00 maximum stake a time. When staking such a large amount of money on a bet, you will need to be mindful not to go for large odds because you will need enormous liabilities in the betting exchange and given the amount of profit you will be making, it is just not worth it. Assuming you get back and lay odds of 2.0/2.02. Now you look at the odds boost given to you, you can actually get a price of 2.10 and the lay odds are still 2.02. Assuming 2% at Smarkets, you could expect to make a profit of £5.80 guaranteed provided you have staked £200.00 also. From this example, you can see that we have essentially created an arbitrage opportunity by taking larger back odds at the bookmakers than the betting exchange lay odds at Smarkets. That is all you need to do to make profits from the odds boosts; just find a close match on the Oddsmatcher at Oddsmonkey and you will basically be placing an arbitrage bet. Are odds boosts good for account health? As you have seen above, you are basically placing an arbitrage bet by taking bigger odds at the bookies than the lay odds at the exchange. As we already know, placing arbitrage bets is the quickest way to getting our bookmaker accounts gubbed or restricted. Therefore it would be good to know that odds boosts are bad for our account health because at the end of the day, they are still arbitrage bets. If you decide to do odds boosts, I would only recommend doing them once a week maximum. If you do them every day, you are increasing the chances of getting your account gubbed with the bookmaker and that is something we always want to avoid. Given there are many ways to make money from matched betting, odds boosts are certainly not the best way to make money from matched betting. You would be far better off looking at other offers like the early payout offer or even accumulator bets as you would get far more return on your money than dealing with odds boosts. I personally think that odds boosts offered by the bookmakers are a tactic to catch our people who place arbitrage bets. If you take an odds boost for example on a rating of anything less than 95% on the Oddsmatcher tool at Oddsmonkey, it won’t flag up as an arbitrage bet because the odds won’t rise that much after the odds boost. To be able to make even just a small amount of money on odds boosts, the odds have to be an arb already or at least 99% rating to make just a few quid. It seems silly to potentially risk your account for the sake of a few quid when there are much better ways in the matched betting world to make money. I personally do not use odds boosts for the reason that I think they are basically bait for arbers and for the bookies to catch our arbers. If you do try them out regularly, you do so at your own risk but I wouldn’t advise doing them on a regular basis. Doing them once a week or even a month would be the absolute maximum for the odds boosts. Odds boosts basically enhance the odds you are getting from the bookmaker and they generally go up probably an extra 5% maximum. 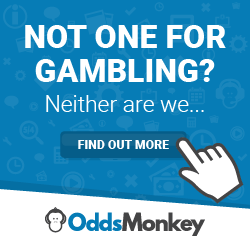 However if you get a close enough match on the Oddsmatcher at Oddsmonkey, you can expect to make a profit guaranteed no matter what the final outcome on the event you are betting on. If you are signed up to a variety of bookmakers, you will find you get odds boosts from a few of them. I have known these to be popular with Ladbrokes and William Hill mainly. The only way to make money from matched betting with odds boosts, is by getting matches on the Oddsmatcher which are arbitrage bets already or at least have a rating of 99%. If you find a match that has a rating any less than this and you will find it very difficult to make a profit that is even worth the time and effort it takes. If you decide to do odds boosts as part of your matched betting strategy, I would do a maximum of one a week/month so that you don’t potentially get your account gubbed at the bookmakers. If you do them daily, you might as well kiss your betting account goodbye as it won’t be around for long. Bookmakers hate arbitrage bets so it is always best to avoid them where you can. Don’t forget to use the Oddsmatcher at Oddsmonkey and you can join them by clicking here.